PEX Summer Festival is Sold Out! What Where When Guide Released!!! Make your plans for PEX Summer Festival! Check out what's happening and figure out what you need to participate in other group's activities! Save money. Make friends. Help us keep down the number of cars on site so there's more room to dance! What other reasons do you need to ride share? Camp WANNAWANNAPEX is on a roll! Music, Workshops, and Art Grant Lineups have been announced! Check them out! Auditions are now open for Russian Roulatte Variety Show and Flowcase! Submissions for a scheduled performance at Center Camp Stage as well as 2-D Art submissions for the Center Camp Art Walk. And don't forget to submit your events for listing in the wWw Guide! Want to learn more about our new Art Car Derby Collection? Have you heard about our new Merit Badge workshops? We're kicking off the inaugural year of Camp WANNAWANNAPEX with activities for lil PEXies and big PEXies alike! Learn more about opportunities to PARTICIPATE, DONATE or CREATE with Camp WANNAWANNAPEX! Time's a ticking for Art Grant Applications! Art grant deadlines are quickly approaching. The availability of art grants is intended to help defray the costs of materials and transportation related to creating and presenting works of art at the PEX Summer Festival. This year we have opened up grants and applications to even more types of Art. Now accepting 2D Art submissions for display at Center Camp. Apply HERE! Art Grant applications due on March 30th - Apply NOW! Grants applications for Interactive Arts Events due on April 15th - Apply SOON! 2015 Theme Camp & ArtCabin Row submissions open! 2015 Art Grant and Workshop application time! Applications for Theme Camps, ArtCabin Row and Volunteers will be available shortly! The Philadelphia Experiment is excited to announce the Seventh Annual PEX Summer Festival July 3-6 at Camp Ramblewood in Darlington, Maryland. 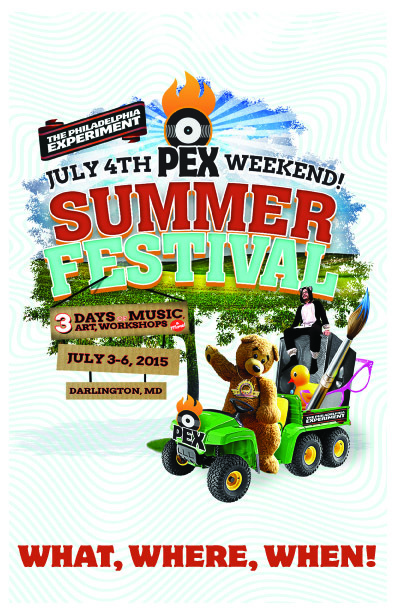 PEX Summer Festival is a multifaceted, multi-dimensional music & art celebration! We will be uniting for three days of amazing music, art, education, and participatory, shared experience. If you have attended PEX Summer Festival as a paid ticket holder, within the past 3 years, you will receive an invite. If you did not, Request an Invitation! If you have attended PEX Summer Festival more than 3 years ago and would like to participate, Request an Invitation!